I've been on the lookout for 4mm pre-grouping drivers and firemen recently, but so far with limited success. Meanwhile, here's a couple of modified ones from IKB. For me, tiny projects like these are as much fun as the more substantial work. The IKB fireman seen above is unusual in that, unlike 90% of 4mm firemen, he is not furiously shovelling! Unfortunately the mould lacks a bit of bulk, so I extended his girth using plastic putty. The nose was re-sculpted and the original whiskers were replaced in order to enhance relief and character. The camera has interpreted the trousers as black, while in reality I've given them a blueish tone. (Edit: See discussion on colour of jackets below). The driver uses the IKB body and the re-sculpted head of a Langley cartage man. The IKB crew actually includes a couple of extra heads, which is a great idea but I had already used these on other figures. The arms have been repositioned to reduce the stick-like appearance. Here's the crew temporarily mounted in a River Class loco. The loco was built to near-finished condition by the late Dave Perkins from a Peter K kit, and is now allocated to Farthing. There are various issues with the paintjob and boiler fittings that I need to look into (my doing, not Dave's), but she is a very sweet runner. The IKB crew is nominally "Victorian" by design. However the characteristic buttoning of jackets at the top is also evident on footplate men in some Edwardian photos. Having said that, the pre-grouping uniforms of GWR footplate crew don't seem to be very well described in the literature, and I'm unsure exactly what is correct for Edwardian times. 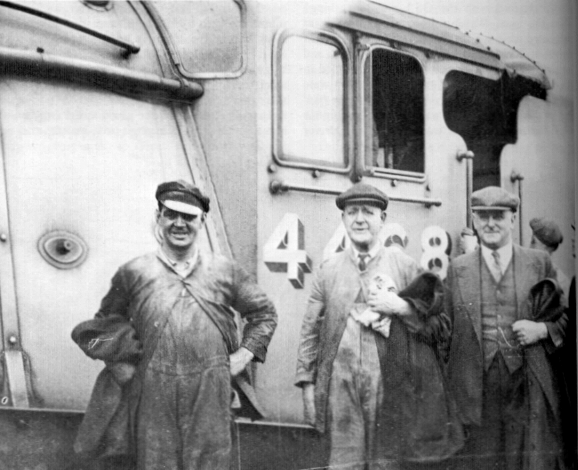 In fact, a casual scan of photos from that period reveals a bewildering variation in the styles of jackets and caps worn by footplate crew. One pitfall here seems to be that many of the people on the footplate in such photos aren't actually crew, but inspectors etc. I also have a theory that drivers and firemen sometimes put on their private clothes and/or headwear in order to look decent in photos. Finally, given their working conditions I'm guessing that footplate crew resorted to a variety of protective clothing at different times of the day and year. Perhaps not all of this was standard? While on the subject of figures, I hear that Falcon offer some good 4mm footplate crew, but I am unsure what period they are for, and whether they are obtainable on-line? Oh, and wouldn't it be great if we had something like Heroes of the Footplate in 4mm scale! Its true the little details make all the difference, very nicely done. Yes, it's amazing what a difference it makes to a loco when you add the crew, isn't it. For your own current project you would have quite a choice of Playmobil figures to choose from for the footplate, although I guess making them look realistic would be rather tricky! Hi Nick, thanks for picking this up - I was hoping to get some response on this issue at there doesn't seem to be much information available on it. Actually the colour of the jackets in the photos is grey (which is also how they show up on my screen, but apparently not on yours). I must admit I chose this colour partly because I have seen it used by other modellers of the era - always a dangerous move! - and partly because it seems to tally with what I can make out from photos. In the Slinn Book ("GW Way") I noticed the mention of white fustian jackets being phased out in the 1870s, and that they probably remained in use for some time after that. But could they really have survived another 30 years into the 1900s? Or are the jackets which appear in photos from Edwardian days perhaps the next generation of footplate jackets, worn on top of the standard uniform in order to provide protection from soot etc? in the 1880s" published by by the BGS. Carpenter (Wild Swan 1983) which features photos from ca 1904.
until ca 1920 was inexpensive unbleached white duck." * Again, light jackets over waistcoat seems to have been the norm. Trousers often much darker than the jacket (dark blue?) but not always. Caps dark like the trousers. Ties not immediately apparent in most photos, especially earlier period. Drivers sometimes with watch chained to waistcoat. * Jackets have either four or five buttons (although hard to say in many cases), frequently buttoned at the top only (by both drivers and firemen), but not always. When jackets are fully buttoned they seem to be slightly darker, which might suggest that there were two types of jackets - perhaps the lighter ones were the old white fustian types still going strong? One shot shows two apparently similar jackets with different arrangement of pockets. * In some of the shots the driver seems to be wearing a different and more formal style than the fireman, with darker clothing and a stiff cap. I get a sense this is especially the case in earlier photos. Looking at Slinn's description, there seems to have been a general changeover towards a slightly less formal attire in GWR uniforms in 1902. This includes introduction of soft caps to most grades (see also: http://www.gwr.org.u...esuniforms.html). Perhaps during this change the drivers lost their more formal attire, and the uniforms of drivers and firemen became the same? So where does this leave us? Confused at a higher level, I guess . It would be good to know how staff obtained their uniforms, and whether they carried the same uniform as long as they remained within a particular grade, or changed it when new styles were introduced. Also, were there regional differences (eg Wolverhampton vs Swindon)? Hi Chris, I can imagine this must be tricky in 2mm. It's interesting really, how we now demand of ourselves that our modelling - including figures - must look real even when enlarged to many times their actual size! They do actually have an HO range of figures that I've not seen befiore, will have a closer look - many thanks. Yes and they look pretty good in HO as I would expect given the standard of the 2mil ones. Hi Bob, I saw your cameo with the City and rather liked it. Good Edwardian figures in 4mm are a bit thin on the ground in my experience. You are of the same opinion as me then. I bought a mixture of Dart and Langley for that first effort of mine, and found the Dart ones to be much better quality, in terms of detail, than the others. I've just ordered a bunch more from them for my next project, although I won't hold my breath this time, as their attitude to delivery times is akin to that of Spanish builders. I'm also trying some figures from Autocraft this time. I did buy the 'Edwardian woman with parasol' (not sure she shows on the pictures already posted) from MRD, but Lord knows what scale they're using. Had I not hacksawed off the bottom 1mm or so (luckily she had a long dress), she would have been about 7 feet tall, and she dwarfed the 'Langley' man standing next to her. She was also very 'broad in the beam' across the shoulders and face, so I gave her a quick squeeze in the mini-vice to give her more lady-like proportions. I've already spent an amiusing time looking through the Preiser catalogue, and I appreciate your 'heads up' about scale. That is my concern with U.S. and continental manufacturuers, because their model railways are a slightly different scale, is that right? I will have to have a look at IKB though, for the sake of some variety. Thanks agian for the advice! Bob, many thanks for sharing your experiences. You're acturally the first person I have "met" to have tried out the MRD figures. The lady in question does sound rather tall (! ), although I actually find the Dart castings people a bit on the short side. I guess modellers are a hard bunch to please . Yes the US and continental figures are typically for HO, meaning they are 1:87, while OO of course is 1:76. As for IKB, the range sadly only consists of the two figures in the loco crew set, AFAIK. I wasn't aware that Autocraft do figures, that sounds interesting. Is there a website for them? I bought two of their porters with trolleys through Ebay (autocraftmodels they're know as on there), but I'm darned if I can find any reference to them on their website (mind you it is a year out of date!) and I'm sure they are copies of something I've seen elsewhere (perhaps Springside or Dart.) Their photos are sort of BR, but mine are as yet unpainted and will be modified to look more in period. Like you said, I am wondering if I'm too hard to please as regards detail, but I'm sure I recollect from my childhood, having a set of Airfix 'civilians' that had better detail than the stuff from Langley and MRD. Thanks for the link Bob. The website does look a bit out of date. Nice vehicles though! Well it's been a while Mikkel, but your beautifully detailed work inspired me to make my own effort. Having had the problems of sourcing Edwardian pieces last time, I plumped for the easier option and created something of a little later than your time period. My "The 'up' goods from Stourbridge" diorama depicts a goods yard somewhere in the SW Midlands circa 1930. Hi Bob, what a great slide show, the scenes are so full of atmosphere. I especially like the look into the goods shed with the open van, and the company vehicle having its wheel changed :-) The colours blend together very nicely, that's often one of the hardest bits, I find. The Replica/Bachmann panniers are my favourite RTR locos, you make them look really good. Often fancied building a whole layout around a couple of these, eg the Brentford branch, which had several of them working the docks there. Many thanks for sharing - brightened up the evening of a dreary day! Thanks for the praise (never feel I've got it quite right whatever I do). Sad to hear your day is dreary. Isn't your latest project something to brighten the day? If you have to use bits & bobs from the bottom of the Ebay bargain bin (which I do), then old Replica (Bachmann China) locos are hands down the best for detail (when you can get them). What do you do with them once they're done though? The fun for me was in the doing; solving problems and such. Now it's finished, I'm at a loss to find something to do with it, not having any space. Donate it to Didcot museum? Yard lights and mist sounds really good - I can see that is must be hard to photograph though! The camera I use is an Olympus "mju". Allround, it is definetely nothing special and I would not really recommend it anymore (!) as there are now much better offerings out there. But it happens to have a macro function for close-ups that works well, and it is very small so can be plonked anywhere on the layout. As for sharpness, I tend to simply take multiple shots until one is actually in focus :-) But the depth of field is not good, as you'll notice. Chris Nevard's photography is fantastic, talk about sharpness! Sounds like you're a serial layout builder rather than an operator :-) Wemyss Bay station would be quie something as a model. If you like challenges and problem-solving why not go for it? (easier said than done, I think!). Don't know if anyone has done a layout of it before? Well, it took me a while to finish it, but the yard lighting is now complete, and added a grounded van body to conceal the light switches.. Even had a crack at some 'misty' night shots (still learning my camera functions as I go). Bob, that is a fantastic photo! I hope you'll post it in the "Realistic images" album. Many thanks for sharing, there is much inspiration in there.